The craft beer-focused activation addresses beer lovers’ growing demand for barrel-aged beers and will feature 17 small and independent Jameson craft brewery partners and their limited-edition Jameson barrel-aged beer in a setting that draws inspiration from their local neighborhoods. Participating breweries include 8th Wonder, Bale Breaker, Big Dog’s Brewing, Black Abbey, Captain Lawrence, Cigar City, DC Brau, Fat Heads, Foolproof, Fulton, Great Divide, Green Flash, Harpoon, Heavy Seas, Parish, Revolution and River Horse. The new, 12,600 square foot craft beer garden will be part of a nearly 100,000 square foot expansion of the festival floor, and joins PAIRED®, CraftBeer.com Pavilion and other craft beer and food occasion programs at GABF. Brewers have long used whiskey barrels to age their beers and sales of barrel-aged beer have increased by 20 percent over the past three years. 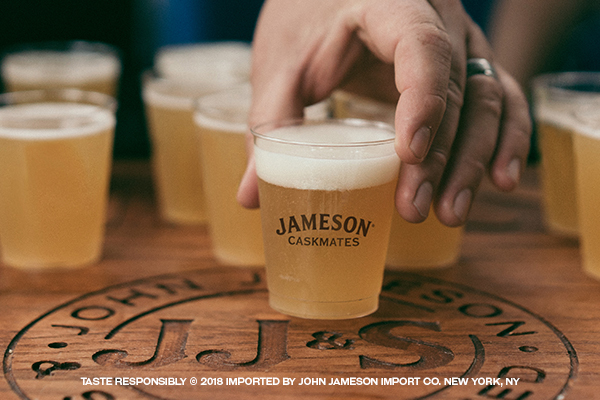 As part of the Jameson Caskmates Program, Jameson sends breweries across the U.S. used Jameson barrels from the distillery in Midleton, County Cork, Ireland. Those breweries age a variety of unique and neighborhood specific barrel-aged beers for sale locally. GABF is the premier U.S. beer festival and competition, bringing together the brewers and beers that make the U.S. the world’s most diverse brewing nation. Since its inception in 1982, GABF has been growing and evolving along with the American brewing community and represents the largest collection of U.S. beer ever served, in the format of a public tasting event plus a privately judged competition. GABF will take place September 20-22, 2018 at the Colorado Convention Center in Denver, Colorado. GABF tickets go on sale August 1.